New Street Triple R. More aggressive. More attitude. Street Triple R. It's a Street Triple with attitude. The most fun you can have on two wheels. 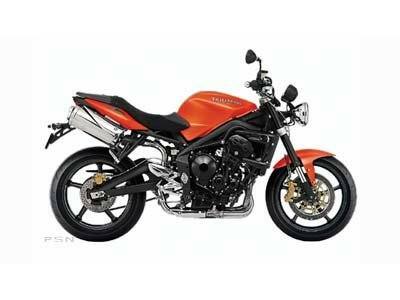 Take a standard Street Triple and add supersport specification suspension and brakes. Mix in some premium color schemes and take the skills and experience of Triumph's outstanding development engineers to hone to perfection. The result? A motorcycle that has won universal acclaim since its introduction in 2008 and which is guaranteed to leave the rider grinning from ear to ear. The Street Triple R's lightweight frame has been lifted directly from the award-winning Daytona 675 sport bike. 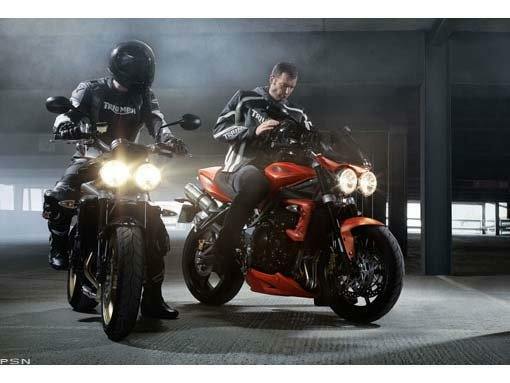 Fitted with fully adjustable front and rear suspension, Nissin 4-piston radial front calipers and radial master cylinder, the Street Triple R's sublime handling and control are the stuff of legend. You won't believe it's a 675. Distinguishing the Street Triple R are three stunning color schemes: Matte Graphite, Intense Orange, and a new Phantom Black with Gold. The Street Triple R is not a subtle motorcycle. It's a bike for those who like to take it to the max.